"Continuing on its 30th Anniversary Celebration theme, Casio G-Shock is introducing the previously mentioned “Thirty Stars” Series to kick off the month of August. 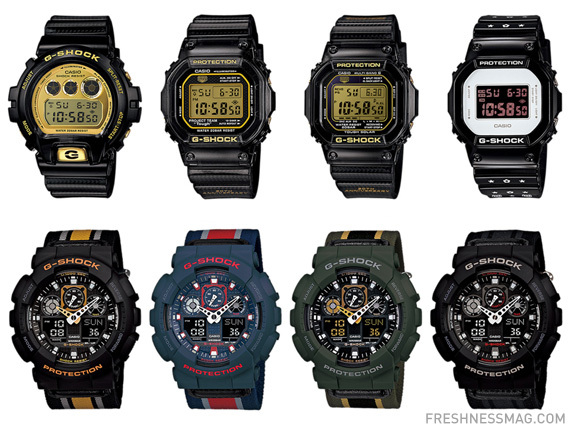 Embellished with metallic gold dial on textured black finishes, the series focuses on the quintessential G-Shock editions from the past 30 years. This includes the DW-6930D-1JR and GW-M5630D-1JR, both packaged in a custom tin case created by artistEric Haze. There is also the GSET-30-1JR twin pack, featuring a GSET-30-1JR watch in the original DW-5000 colorway and the other in the 30th Anniversary gold design, along with a G-Shcokman vinyl figure. 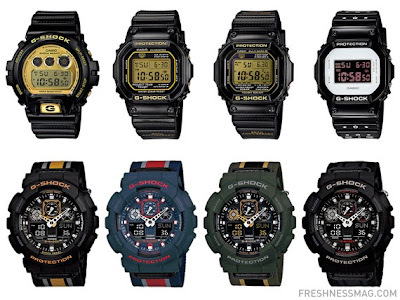 Another aspect of the 30th Anniversary is G-Shock’s collaborations, both past and present. In addition to the G-Shock × MEDICOM TOY DW-5600MT-1JR watch and its BE@RBRICK-shaped case, a DW-6901UD-3JR version with retailer UNDEFEATED (UNDFTD) is also in the works. Finally, there is “Military Color” Series, Casio‘s take on the popular military field watch by adding a nylon cloth band to its GA-100 model. In all, eleven new designs set to debut this month at G-Shock retail locations across Japan, follow by international releases later this year."